A sweet conversation hearts applique design perfect for Valentine's Day. 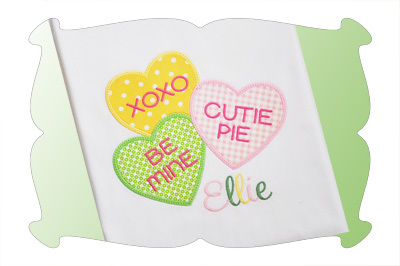 The "Conversation Hearts Applique" design comes in 4 sizes. All sizes included with your purchase! 4x4: 3.90 x 3.38. SC: 6733. 5x7: 4.95 x 4.28. SC: 9025. 6x10: 5.93 x 5.13. SC: 10,909. Durkee 9x9 Hoop: 7.25 x 6.27. SC: 13,611.